Hungry Bone Syndrome should really be called "Bad Doctor Syndrome" because it should almost never happen in patients with primary hyperparathyroidism. "Hungry Bone Syndrome" is almost always due to poor doctor management of calcium requirements after parathyroid surgery. Hungry Bone Syndrome is a term that refers to a patient who has such severe symptoms of low blood calcium (hypocalcemia) that they require admission to the hospital for several days (2-10 days) to get IV calcium to make their low-calcium symptoms go away. It is said that their bones are so hungry for calcium that they can't get enough oral calcium to replenish the bones. The theory is that their bones are so depleted of calcium because of many years of untreated hyperparathyroidism that the patient simply can't get enough calcium orally and it must be given IV for days. Importantly, Hungry Bone Syndrome occurs almost exclusively in patients with hyperparathyroidism associated with kidney failure and dialysis. ANY patient who is not managed correctly after their parathyroid operation can get severe symptoms of low calcium. But low blood calcium symptoms is not the same as hungry bone syndrome. The confusion comes about because a patient with bad symptoms of low blood calcium following surgery for primary hyperparathyroidism can need a trip to the emergency room for IV calcium and the doctors will blame it on the patient… saying "your bones are just hungry for so much calcium, it's not my fault". Well it is the doctors fault almost 100% of the time in cases of primary hyperparathyroidism (the patient was never on dialysis). If the patient's calcium is managed correctly after a successful operation for primary hyperparathyroidism, less than 1 in 1000 will need IV calcium. But, again, needing IV calcium following surgery for primary hyperparathyroidism is not hungry bone syndrome; this is severe low blood calcium symptoms due to a doctor who didn't anticipate the need for calcium allowing the patient's calcium go too low. This is preventable in almost 100% of cases. Hungry Bone Syndrome: Why are people afraid of something that never happens? We hear the term "Hungry Bone Syndrome"about 3 times per week (out of the 53 or so patients that we operate on every week) and it either comes from a rare endocrinologist over 70 years of age that thinks all patients should be hospitalized for several days after a parathyroid operation to watch for severe low blood calcium, or more commonly, it comes from Facebook horror stories. We believe that Facebook can have a very positive role in helping patients cope with the fears and concerns associated with hyperparathyroidism, it's diagnosis and treatment. However, since Facebook groups allow virtually anybody to post, write, and give advice, there are several topics that are commonly discussed that cause concern where there should be none (if you have a good surgeon). If one of our patients mentions "hungry bone syndrome", me and all of my partners laugh and hug them, knowing they have been on Facebook and learned about the dreaded symptoms of low blood calcium from people who have experienced things that they probably didn't need to experience. Bad advice and fear follows, and the concept of "Hungry Bone Syndrome" is propagated. It was a Facebook post and discussion this past week that prompted this article. While preparing to write this, I asked my partners Drs Politz, Lopez, and Toro how many times they have seen "Hungry Bone Syndrome" in the past year, and every one said "zero", and I concur. When asked how many times they have seen it in the past 5 years, combined we have seen it 3 times (and all three had very special circumstances and had tertiary hyperparathyroidism-they had renal failute, then dialysis, then a kidney translpant). These casese are NOT routine cases of primary hyperparathyroidism. That's three cases of Hungry Bone Syndrome in our last 10,500 parathyroid operations. Listen folks, if you are not on kidney dialysis, and you have a smart doctor, then the chances of you getting Hungry Bone Syndrome is near zero. It is not even worth discussing, and you should not be concerned if you have a good surgeon (geeze, it always comes down to having a good doctor with lots of experience, doesn't it?). Let's take a good look at what causes Hungry Bone Syndrome, distinguish it from routine "symptoms of low blood calcium", and what should be done to prevent Hungry Bone Syndrome BEFORE it happens-so it doesn't happen. Hungry Bone Syndrome Vs. Routine Symptoms of Low Blood Calcium. Everybody who has primary hyperparathyroidism will experience a decrease in their blood calcium levels after successful parathyroid surgery. EVERYBODY. That is the point of the operation; to remove the source of the excess parathyroid hormone and allow the normal parathyroid glands to take over and control the blood calcium in the normal range. If the calcium level goes too low (this is relative! ), or decreases too fast, then patients will get symptoms of low blood calcium. If you have hyperparathyroidism and your blood calcium is 12.0 mg/dl, you will get symptoms of low blood calcium if it decreases to 9.5 (normal!) within 24 hours. Thus, you can get symptoms of low blood calcium even if your calcium is NORMAL-if the level changed too fast. Since all patients undergoing successful parathyroid surgery will have a decrease in their blood calcium, we must put them on oral calcium so the decrease in their blood calcium levels occurs over a period of a week or two, instead of a day or two. Our goal in our patient with a blood calcium level of 12.0 mg/dl is to have their calcium level about 11.0 the next day, 10.5 the day after that, 10.0 the next day, and not down into the normal range (9.5 or so) until 4-5 days after the operation. If we are successful in allowing the blood calcium to decrease slow enough, that patient will not get ANY symptoms of low blood calcium. We have published three landmark articles on this topic in the past 6 years which allowed us to develop a "formula" so we know how much calcium to put all our patients on. One of these articles is shown on the left-links to all three are at the bottom of this blog. If any patient is not taking enough calcium after the operation, they are at risk for getting symptoms of low blood calcium (tingles in the hands/fingers, tingling around the lips, confusion, anxiety, and a feeling like their body is vibrating). This cannot happen within the first 24-36 hours of the operation, so don't call me the day after your operation and tell me you have symptoms of low blood calcium-you cannot. Symptoms of low blood calcium are not a big deal. They are predictable, self-limiting, and easy to control. Do not be afraid of symptoms of low calcium! Note that if you call us to tell us that you are having symptoms of low blood calcium and we don't get all excited, it's because it isn't that big of a deal. In some ways, having tingles after an operation are a good thing! For our patients (who are already taking lots of oral calcium) it means we underestimated the amount of calcium they need, and their osteoporosis was worse (or reversing faster) than we thought. Great! Take more calcium (or take a different brand). This is why our patient instructions allow them to take 10 calcium pills in a 24 hour period without calling us to discuss. Because we know you can't get into serious problems. We know what all four of your parathyroid glands are doing, and we know that you are going to be OK. Symptoms of low blood calcium seen in less than 7% of our patients (seen in 90% of some other surgeon's patients-keep reading below!). The reason we have less than 7% having low blood calcium symptoms (and virtually never Hungry Bone Syndrome) is because we have studied this for 25 years on well over 20,000 patients. We have published protocols in medical journals (see links below) that allow us to prescribe the right amount of oral calcium for our patients allowing their calcium to decrease slowly over a week or two thereby avoiding symptoms of hypocalcemia (low calcium), and completely avoiding "Hungry Bone Syndrome". So how can a patient with primary hyperparathyroidism get Hungry Bone Syndrome? They can't. BUT, they can get really bad symptoms of low blood calcium if they are not started on calcium pills right away and their blood calcium is allowed to go really low, really fast. These patients can need a trip to the emergency room for IV calcium, but they are not getting Hungry Bone syndrome (which requires 5 or more days in the hospital to get IV calcium around the clock). 10 Ways to Prevent Low Blood Calcium Symptoms, and Hungry Bone Syndrome. In order to prevent symptoms of low blood calcium (and it's bigger, nastier brother, Hungry Bone Syndrome), the patient undergoing parathyroid surgery for hyperparathyroidism must be put on lots of calcium after the operation. HOWEVER, no surgeon in the world will do this unless they are confident the patient is cured. Putting a patient who is not cured on high dose calcium could cause hypercalcemic crisis (very high calcium crisis) and possibly stroke/death. If your surgeon isn't putting you on lots of calcium after your operation-it is because he/she is not sure you are cured and they don't want to risk having your calcium go dangerously high. Folks, do you understand this? If your surgeon isn't putting you on at least 1200 mg of calcium daily after your operation, it is because they are not confident you are cured. Here is how we avoid symptoms of low blood calcium in 93% of our patients… it starts with confidently curing the patient! Look at and assess all four parathyroid glands during the parathyroid operation. In order to put patients on lots of oral calcium after their operation, we need to know that they are cured. Of course, the best (only) way to know this is to make sure every parathyroid gland that a patient has remaining in their neck is functioning normally. We don't want to give somebody high doses of oral calcium if we aren't sure they are cured! If your surgeon isn't looking at all four parathyroid glands, there is a 95% chance they are not putting you on lots of calcium (or just tell you go to home and eat some "Tums"). Know how much parathyroid hormone (PTH) the normal parathyroid glands are making. We need to know that all remaining parathyroid glands are functioning normal and not dead (killed by the "exploring" surgeon). At our Center, we do this two ways: A) in the operating room we measure the hormone production from EACH parathyroid gland, and B) before our patients go home-about 1.5 hours post-op,-we draw a small tube of blood from their arm to measure the PTH (it should be very low, but not zero). Estimate the duration of the disease. Patients who have had primary hyperparathyroidism for many years have lost LOTS of calcium from their bones and therefore will require more calcium pills for the first few weeks post-op. Now you are beginning to understand why we want lots of old labs, why we look at your associated diseases (caused by years of high blood calcium), and why we talk about the "duration" of the disease with every patient. We have multiple blogs on duration of disease. Know or estimate the amount of bone loss. This relates to #3 above, but specifically this refers to our patient's bone density DEXA scans. The worse your osteoporosis, the more calcium pills we will put you on post op. We generally require a DEXA scan on our patients. One reason is so we can give you good advice about what to do to make your osteoporosis better, but the other reason is so we can estimate how much calcium you will need in the first few weeks post-op. Avoiding Hungry Bone Syndrome is easy if you are smart! Start oral calcium within first 30 minutes of the operation. We have learned that this is imperative. We usually give the first calcium pill within the first 15 minutes of the operation. Provide the calcium pills to the patients. We have learned that you cannot tell the patient to go buy some calcium pills. The surgeon must actually give calcium pills to the patients if you expect them to take the pills. Telling the patient to "go to the store and get some Tums" is absurd and is only done by lazy, uninformed surgeons. Tums are a terrible source of calcium and were never intended to be used in this fashion. Call the patient the night of surgery to make sure they are taking their calcium pills (is your doctor going to call you?). Educate the patient (in writing and orally) about the importance of taking calcium pills post op and allow them to treat themselves (take more calcium) if they have any symptoms of low calcium. Provide a phone number for the patient to talk to one of the nurses or doctors to chat about symptoms of low blood calcium if necessary. Educate the patient about the need for lots of calcium post op, but give them a phone number to call in case they get nervous. Trust me, when your calcium is low and your body is vibrating you want to talk to somebody. But remember, all we're going to do is tell you it is ok, only lasts a day or two, and will go away by taking more calcium. There is no such thing as Hungry Bone Syndrome in patients with primary hyperparathyroidism. Don't confuse symptoms of low blood calcium with such severe symptoms that require a trip to the hospital for days of IV calcium (Hungry Bone Syndrome). We operate on over 2,600 parathyroid patients per year and less than 1 per year has to go to the hospital for IV calcium, and less than 2 every 5 years needs to be admitted to the hospital for more than 1 day of IV calcium. 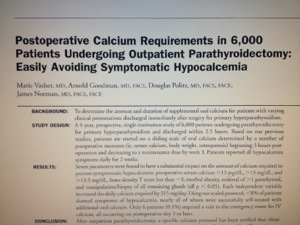 Low blood calcium is predictable after parathyroid surgery. Low blood calcium is not a big deal (if you are taking your calcium pills). Low blood calcium is self-limited (a couple of days). Low blood calcium is NOT Hungry Bone Syndrome. Patients with primary hyperparathyroidism really can't get hungry bone syndrome, except in very special, rare circumstance. And having low vitamin D does not increase this occurrence. The horror stories of hungry bone syndrome on Facebook and other parathyroid blogs are really cases of severe hypocalcemia occurring in patients who 1) were not put on any calcium post op (80%), or were not put on enough calcium (15%,) or 3) did not take the calcium as prescribed. Hungry bone syndrome should be called "Bad Doctor Syndrome", and it should be extremely rare, just like "Cut your vocal cord syndrome" and "Had a big blood clot in my neck post-op syndrome". They are all avoidable and should be extremely rare! One final thought… the last of our three research publications discussed on this blog looked at the occurrence of symptoms of low blood calcium and hungry bone syndrome in patients with high, normal, and low vitamin D levels (3,000++ patients). There was no difference. A low vitamin D level is seen in about 90% of patients with primary hyperparathyroidism and a low vitamin D level does NOT increase a patient's chances of getting symptoms of low blood calcium or hungry bone syndrome after the operation. Period.